Synthetic peptide within Human POLR3G (internal sequence) conjugated to keyhole limpet haemocyanin. The exact sequence is proprietary. 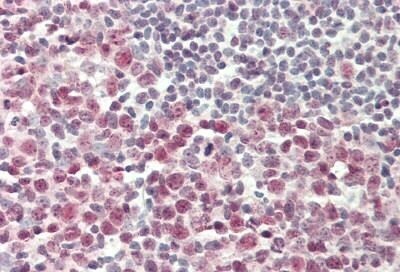 WB: MCF7, RAW 264.7 and H9c2 whole cell lysates. 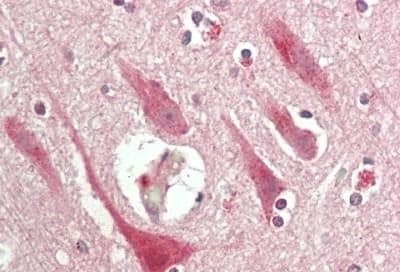 IHC-P: Human tonsil and brain tissue. Our Abpromise guarantee covers the use of ab230854 in the following tested applications. WB 1/500 - 1/1000. Predicted molecular weight: 26 kDa. DNA-dependent RNA polymerase catalyzes the transcription of DNA into RNA using the four ribonucleoside triphosphates as substrates. Specific peripheric component of RNA polymerase III which synthesizes small RNAs, such as 5S rRNA and tRNAs. May direct with other members of the RPC3/POLR3C-RPC6/POLR3F-RPC7/POLR3G subcomplex RNA Pol III binding to the TFIIIB-DNA complex via the interactions between TFIIIB and POLR3F. May be involved either in the recruitment and stabilization of the subcomplex within RNA polymerase III, or in stimulating catalytic functions of other subunits during initiation. Plays a key role in sensing and limiting infection by intracellular bacteria and DNA viruses. Acts as nuclear and cytosolic DNA sensor involved in innate immune response. Can sense non-self dsDNA that serves as template for transcription into dsRNA. The non-self RNA polymerase III transcripts, such as Epstein-Barr virus-encoded RNAs (EBERs) induce type I interferon and NF- Kappa-B through the RIG-I pathway. Belongs to the eukaryotic RPC7 RNA polymerase subunit family. Formalin-fixed, paraffin-embedded human tonsil tissue stained for POLR3G using ab230854 at 1/100 dilution in immunohistochemical analysis. Formalin-fixed, paraffin-embedded human brain tissue stained for POLR3G using ab230854 at 1/100 dilution in immunohistochemical analysis. ab230854 has not yet been referenced specifically in any publications. Publishing research using ab230854? Please let us know so that we can cite the reference in this datasheet. There are currently no Customer reviews or Questions for ab230854.